Welcome to the Premier League, Antonio Conte, the honeymoon is officially over. Three wins from the opening three games presented room for optimism, but Conte’s Blues remain win-less in league play since the international break. The talks of a possible title challenge have halted, and fears of last year’s nightmare sits in the minds of Chelsea fans across the world, and most certainly the players. Apart from the departure of Jose Mourinho and the summer signing of N’Golo Kante, Chelsea’s XI is identical to last year’s side that produced the worst title defence in Premier League history with a tenth place finish. Very little has changed in personnel, and Conte’s task of returning this group of players into champions appears to be an insurmountable task. Where Mourinho failed, Conte is now asked to succeed. David Luiz, Michy Batshuayi and Kante’s arrivals wouldn’t be classified as a great transfer window when compared to their title rivals, but a combination of athleticism, dynamism and youth doesn’t hurt a Chelsea side that psychologically crumbled during tribulation last year. The Blues were convincing winners against a travelling Bournemouth side, and late goals against West Ham and Watford suggested that during the rough times Conte was capable of altering his tactics to gain a result. Where pre-season title favourites Manchester City and Manchester United were also perfect, Chelsea were keeping pace via the rejuvenated Diego Costa and a remarkable ball winner in Kante, who effortlessly protected the back-four. Oddly enough, Chelsea produced their best performance of the season en route to their first blip of the season. The Blues flabbergasted Swansea at the Liberty Stadium for lengthy spells of their 2-2 draw, but several spurned opportunities from Eden Hazard and Diego Costa proved costly – despite the latter scoring two goals and earning a point from a losing position. Thibaut Courtois conceding a penalty tipped the momentum in Swansea’s favour, but Gary Cahill’s mental lapse – despite being fouled in the process – gifted Leroy Fer a goal that’s practically inflicted a blow to Chelsea’s back-line. Perhaps John Terry’s injury shouldn’t be downplayed, but though the Chelsea’s captain’s absence deprives Conte an organizing leader at the back, it isn’t a legitimate excuse for the Blues’ current woes. Liverpool and Arsenal were always going to provide a fair assessment of Chelsea’s progress under Conte, and the most in-form teams in the league – apart from Manchester City – comfortably dominated the West London side in every aspect. Liverpool came to Stamford Bridge and overloaded central areas to produce arguably the best first half performance of the season – to be frank, 2-1 was flattered Conte’s side. More so, the manner in which Chelsea defended and conceded was shocking. They sat deep in a 4-5-1 and were reluctant to apply pressure in midfield. Jordan Henderson controlled the match from a deeper position – scoring an unbelievable goal in the process – whereas the attacking quartet constantly interchanged positions to overwhelm Nemanja Matic and Kante. Still, Dejan Lovren’s opener illustrated the issues Chelsea still encounter at the back: Coutinho’s whipped ball into the box met three unmarked Liverpool players at the far post, and the Croatian’s inch-perfect side-foot volley flew past Courtois. The Blues were no better at the Emirates, but once again, a defensive individual mistake proved decisive. Alexis Sanchez nicked possession from Cahill, and charged into a 1v1 break with Courtois, before chipping the ball over the Belgian keeper. Chelsea trailed within the opening 10 minutes and shortly afterwards Arsenal inflicted further damage. This time it was Hazard who failed to fulfill his defensive duties, as Hector Bellerin charged beyond the Belgian to receive Alex Iwobi’s pass in half space and the Arsenal right-back’s low cross met an unmarked Walcott to double the Gunners’ lead. A terrific counter-attack inspired by Mesut Ozil bamboozled Kante and witnessed the German combine with Alexis to put the match out of reach. “We started this game in a bad way, and from the first minute” said Conte. Nonetheless, Conte’s men persisted on sitting off the opposition with neither Cesc Fabregas – who played 120 minutes midweek and probably shouldn’t have started despite scoring two goals – and Matic eager to press Santi Cazorla and Francis Coquelin. This was equally further evidence that Fabregas shouldn’t operate as a shuttler in Chelsea’s midfield trio, as Oscar’s tenacity and work-rate was dearly missed. Chelsea were outclassed for the second consecutive week, and though they moved into key positions via Hazard and Willian, Conte’s men lacked an end product in the final third. Diego Costa was positive in spurts, but Shkodran Mustafi and Laurent Koscielny’s intent to tightly mark and freely foul the Spanish international limited the Chelsea’s striker’s threat. Fabregas failed to link midfield and attack with his rushed forward passes, and additional poor outings from Cahill and Branislav Ivanovic are also responsible for Chelsea’s stagnation – it’s simply worrying that David Luiz has been Chelsea’s best defensive player over the past two weeks. Another underwhelming transfer window has placed a Chelsea manager in a difficult predicament as the current crop of defenders and midfielders simply aren’t good enough. The verdict is out on this Chelsea side, and the issues are much bigger than the manager. John Terry and Kurt Zouma’s eventual return should boost the Blues back-line, but Conte’s determination to lure Leonardo Bonucci and Kalidou Koulibaly over the summer suddenly makes sense. Chelsea aren’t in a crisis, and a top four finish still remains attainable given the talent in the squad, but individual mistakes and poor defensive work ethic from Hazard and Fabregas won’t do Conte any favours. We may not see the best from this Chelsea side until Conte brings in his own players, but for once, Roman Abramovich mustn’t’ allow mediocre displays seal the fate of another top manager. The most convincing Manchester United victory during the briefly lived Jose Mourinho era involved another brutal defeat for the reigning Premier League champions and the Red Devils captain watching from the bench. United claimed maximum points within the opening 45 minutes by capitalizing on Leicester’s poor set-piece defending by scoring four goals in quick succession. Although Leicester failed to pose a significant threat on both ends, the quick combination passes and constant overloads on both flanks were positive improvements to United’s open-play buildup. Paul Pogba enjoyed his best game in a United shirt, scoring his first goal since joining the club, and stepping into free space – with Leicester defenders reluctant to press the Frenchman – to test Ron-Robert Zieler on a few occasions. United scored four goals in 20 minutes, and while their overall play was mesmerizing at times – the second goal witnessed every United player touch the ball prior to Juan Mata’s superb finish – it’s key to note that they exploited Leicester’s set-piece defending deficiencies. It was a Mourinho-esque win, and though the Portuguese manager downplayed his pleasure, it’s a step in the right direction. Daley Blind’s set-piece deliveries were crucial, Antonio Valencia continues to impress with his offensive mindset at right-back, and though Ander Herrera isn’t an ideal partner for Pogba in a midfield two, the Spaniard’s tenacity, ball retention skills and incisive passing will help United unravel deep defensive lines. Ranieri’s switch to a 4-1-4-1 prevented United from increasing their lead, as his midfield applied improved pressure in central areas, but the match was won by half-time. United were much sharper and fluid when they pushed men forward, and the constant overloads in attacking zones was refreshing. Though Rooney can still play a role in United’s title aspirations, perhaps this was evidence that Mourinho’s best XI doesn’t require his captain. Manchester City maintained their perfect start to the Pep Guardiola era, and once again the Spaniard offered a variation of a 4-1-4-1 that posed issues for Swansea. However, the hosts weren’t completely outplayed here, and relied on Fernando Llorente’s aerial threat to unease City’s centre-back partnership and the diminutive Claudio Bravo. Llorente capitalized on Bacary Sagna’s slip to smash a superb effort past Bravo, but his hold up play and physical presence pegged City’s centre-backs deeper into their half. The Spaniard was an evident reference point for the Swansea attack, but the hosts failed to maximize the striker’s aerial threat throughout the 90 minutes. Nevertheless, Guardiola’s tactical tweaks also played a decisive role in the final outcome. Raheem Sterling maintained width on the left, while Sagna pushed higher up the pitch on the right to ensure City stretched the pitch. Aleksandar Kolarov slipped into a narrow position – basically forming a back three – when Fernandinho pushed forward, and Sagna’s wide role enabled Kevin De Bruyne to receive passes in pockets of space between the lines. It was Sagna’s cross that led to Aguero’s opener, and frankly De Bruyne’s rare profligate passing and finishing around the box prevented a City onslaught. Yet even when Swansea appeared capable of a possible fight-back with their high-pressing, Guardiola tinkered with his side’s shape by moving De Bruyne central and pushing David Silva to the left. De Bruyne grew in prominence following the alteration, and began to receive service behind Leon Britton before charging towards the Swansea goal. The Belgian won the penalty that led to Aguero’s winner, and Sterling’s impressive counter-attacking run ensured City remain perfect under Guardiola. There was general interest regarding Guardiola’s approach without Nolito, and with De Bruyne now likely to be sidelined for a few weeks, the Spaniard will be tasked with identifying another successful attacking solution. Still, despite being only six games into the season, it’s difficult to declare anyone other than City as title favourites. Time to take Klopp’s Liverpool seriously after steamrolling Hull City? The pressure was on Liverpool to build on their terrific performance at Stamford Bridge against Mike Phelan’s travelling Hull City side, and Jurgen Klopp’s men passed their test with flying colours. Their passing and movement was fluid, the pressing was cohesive, and the finishing around the box was ruthlessly efficient. The Reds are beginning to look like a Klopp side. From the opening whistle, Hull City dropped into a 4-5-1 with the midfield and defensive bank within close proximity to limit space between the lines. But Abel Hernandez’s inability to get close to Jordan Henderson allowed the Liverpool captain the freedom to dictate the tempo of the match from deeper positions. With Hull dropping deeper towards their box, Hernandez was equally isolated upfront, and the away side were unable to launch counter-attacks due to Liverpool’s dynamic gegenpressing. James Milner constantly stormed beyond Robert Snodgrass and was a useful outlet at left-back, meanwhile the Hull midfield couldn’t cope with Liverpool’s attacking quartet’s movement between the lines. Liverpool players continuously popped up into space at the edge of the box for pull-backs, whereas Lallana operated in half-spaces and Firmino occasionally drifted wide to encourage forward runs. Ultimately, Ahmed Elmohamady’s dismissal for a handball on the goal-line sealed Hull’s fate. They became a 4-5-0 with no real outlet upfront, and were forced to cope with Liverpool’s relentless attack throughout. At the moment, there may not be a team in better form than Klopp’s Reds, and if they can maintain performance levels of this quality, they will be a difficult team to beat this season. Sometimes injuries can be a blessing in disguise. Son Heung-min is justifying that notion and was once again the catalyst in a Spurs victory. With Eric Dier and Moussa Dembele unavailable, Son slid into the Spurs attacking trio, while Dele Alli operated alongside Christian Eriksen ahead of Victor Wanyama. Although Moussa Sissoko struggled from the right, Middlesbrough’s midfield couldn’t cope with Eriksen or Alli’s movement in the final third, whereas Son’s penetrative runs from the left provided guile. Spurs’ opener displayed their attacking approach vividly: Victor Janssen pegged the hosts’ centre-backs deep with his back-to-goal holdup play, which attracted Adam Clayton to the ball, thus enabling Son to run onto his layoff and place his shot past Victor Valdes. Son’s second was even better as the South Korean international evaded two challenges near the edge of the box and curled an unstoppable into the far post to double Spurs’ lead. Spurs were dominant in the opening period, combining their intense pressing to deprive the hosts an outlet forward, while their quick passing flustered Aitor Karanka’s men. Middlesbrough failed to cope with Spurs’ pressing and constantly conceded possession in their half. On the other hand, Gaston Ramirez was comfortably negated by the presence of Victor Wanyama ahead of the back four. The second half introduction of Adama Traore was promising but his poor final ball negated the substitute’s overall threat. Ben Gibson’s second half goal provided the host’s a lifeline, yet their intention to push forward for a winner left vacant space for Eriksen and Alli to exploit, but similar to Traore, their production in the final third was underwhelming. Still, the several absentees missing didn’t affect Spurs balance from an attacking sense, as Son presents Mauricio Pochettino with future selection issues. The summer departures of Ronald Koeman, Graziano Pelle and Sadio Mane put Southampton’s future in jeopardy. Their main goal-scorer, best player, and top manager moved onto new challenges, leaving many to question whether Claude Puel could bring success to the Saints. Southampton’s trip to West Ham showcased both sides’ limitations around the box during the opening 40 minutes, but the two best performers of the match combined to steer the away side into the lead with the game’s first shot on target. Tadic’s outwards run into the left channel saw Ryan Bertrand run beyond Antonio to receive the Serbian’s pass, and subsequently assist Charlie Austin’s opener. It was a brilliant move that highlighted Bertrand’s threat from left-back due to Antonio’s lack of discipline, and Tadic’s guile in a free role behind Austin and Nathan Redmond. West Ham, however, were dismal going forward: Dimitri Payet failed to influence the match from the right, while Simone Zaza was isolated upfront. Bilic’s attempt at a comeback resulted in Sofiane Feghouli replacing Miguel Lanzini and pushing Payet into a central role. Nonetheless, Antonio’s movement to the opposite flank created space for Cedric Soares to exploit throughout the second half. Tadic and Soares combined in the box minutes into the second half but an impressive Adrian save kept West Ham alive. As the match wore on, Bilic’s men also succumbed to Southampton’s counter-pressing which inevitably led to Tadic’s goal. Cheikhou Kouyate was dispossessed near his box and Redmond’s pass into Austin saw the striker initially play in the advancing Tadic, who coolly rounded Adrian and doubled Southampton’s lead. Puel’s approach worked brilliantly as Southampton outworked and outplayed the hosts courtesy of getting the full-backs beyond Antonio and Tadic’s ability to receive the ball behind the West Ham midfield on numerous occasions. With competent passers and diligent frontmen leading the line, Tadic may finally receive the freedom to maximize his creative talent. Dimitri Payet has had more shots (15) in the Premier League without scoring than any other player so far this season. Since his debut (Aug 2014), Charlie Austin has scored as many Premier League goals as Wayne Rooney (21), despite playing 20 games fewer. Alexis Sanchez’s scored 47 goals in his 100 appearances for Arsenal one fewer than Thierry Henry (48) in his first 100 appearances for the club. Son Heung-Min has already equaled his Premier League goal tally from 2015-16 in just three appearances this season (4). Since the start of 2015-16, James Milner has been involved in 20 league goals for Liverpool (8 goals, 12 assists). Alexis Sanchez and David Ospina’s heroic performances earned Arsenal a valuable point against a superior Paris Saint-Germain side. Arsene Wenger recalled Alexis back to the XI following a 2-1 victory over Southampton on the weekend. Alex Iwobi replaced the injured Theo Walcott meaning Olivier Giroud started the match from the bench. Unai Emery’s 4-3-3 featured Angel Di Maria and Blaise Matuidi flanking Edinson Cavani. Meanwhile Marco Verratti and Adrien Rabiot operated as shuttlers ahead of Gregory Krychowiak. PSG dominance was showcased over extensive periods of this match, but their profligate finishing combined with Arsenal’s resilience provided an entertaining draw. It’s difficult to assess the significance of an early goal. Many tend to believe that it gives the superior team the onus to either increase their lead by exploiting the oppositions nerves, or provides the luxury to maintain a compact defensive shape and break on the counter. But the simplicity over PSG’s opener, here, was alarming. PSG took the lead within the opening minute through a simple passing move where Serge Aurier stormed past Iwobi, and Di Maria’s movement pulled Laurent Koscielny out of position, thus enabling Cavani to attack the right-back’s cross at the near post. Perhaps the early goal highlights Arsenal’s lack of preparation, but surprisingly it didn’t alter the general pattern of the match. It would be foolish for Wenger’s men to chase a game after falling behind in the opening 45 seconds, but the French side were less eager to swarm the Gunners higher up the pitch. However, the goal presented Wenger’s men with a stylistic dilemma as to whether they should persist with their initial approach – the XI suggested they intended to play on the counter – or push men forward away from home. The decision to field Alexis as a central forward has been quite interesting solely based on the notion that his all-round talent should transcend in central areas. This season, however, the Chilean’s difficulties as the lone striker is evident, which is partially down to his style and Wenger’s approach. PSG’s centre-backs were pleased to see Alexis drop into midfield in search of possession – if Ozil was deeper Krychowiak would pick him up, or else Marquinhos would step forward and tightly mark the Arsenal forward. Alexis was an isolated figure throughout the first half, yet when he did receive the ball en route to goal, the wide players nor Ozil attempted to charge behind the PSG defence to offer a goal threat. 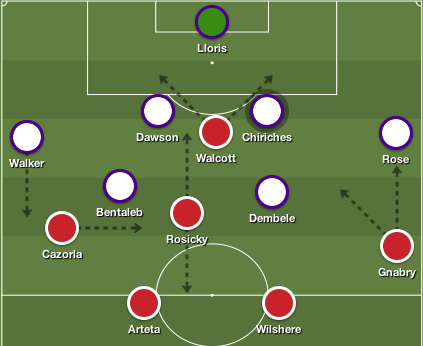 Ozil was often marked out of the match by Krychowiak and when he moved to the left, Verratti shifted to ensure Arsenal couldn’t create overloads. Iwobi and Oxlade-Chamberlain solely posed a threat when they carried the ball in transition, but rarely threatened during spells of possession. And while the full-backs rarely surged forward to offer width, both Monreal and Hector Bellerin lacked a focal point to deliver crosses to within the box. With their key attackers struggling to find space in the final third, and the double-pivot swarmed in possession, the away side created few chances from open play. There were no aerial targets in the box which explains minimal crosses from the wide players, and PSG’s narrow defensive shape easily coped with Arsenal’s attempt to play quick intricate passes in central areas to bypass their back-line. Although PSG monopolized more possession than the Gunners, neither side truly posed danger to the opposition from open play in the first half – a worry for Arsenal who scored both goals over the weekend via set-pieces. Rabiot and Verratti harried Cazorla and Coquelin out of possession, and then cycled the ball into wide areas opposed to playing penetrative passes beyond the Arsenal back-line. This wasn’t necessarily an issues for PSG as they outmuscled and out-passed the Gunners in midfield, but their possession superiority suggested perhaps Emery’s men could have been more adventurous in the opposition’s half. Despite PSG’s inability to maintain Emery’s demanding energy levels to press and regain possession in Arsenal’s half, the French side cleverly combined and created overloads in wide areas. Ultimately, the key player throughout was Aurier. The Ivorian created Cavani’s opener, yet he also surged into space behind Iwobi to constantly provide an outlet from the right flank. The Arsenal youngster failed to track Aurier’s running from right-back, and his first involvement subsequent to the opening goal was a quality cross through the six-yard box that forced Shkodran Mustafi to clear his lines for a corner. Wenger’s attempt to fix the issue resulted in Oxlade-Chamberlain and Iwobi swapping flanks, yet Aurier’s threat persisted against the former and Nacho Monreal. The first attempt rolled into the side netting, whereas David Ospina was quick off his line to keep Arsenal in the match. Aurier was undoubtedly one of PSG’s few goal-scoring outlets, here, as the right-back he drifted into key areas in the final third on several occasions and was unfortunate not to increase the French side’s lead. Where Aurier was the game’s key player, Cavani was heavily involved in the overall outcome. The summer departure of Zlatan Ibrahimovic presented the opportunity for the Uruguayan to play in his preferred central role, but Cavani’s developed a habit of squandering great big game chances during his spell in Paris. For the most part, Cavani’s performance, here, was peculiar: where his movement was exceptional, the finishing was woeful. The Uruguayan played off the back-line’s last shoulder to receive lofted balls from midfield. Wenger’s defence were poorly organized and easily pulled out of position which proved beneficial to the hosts. First, Verratti shrugged off Coquelin’s challenge before his reverse ball was deflected into the path of Cavani who rounded David Ospina, but guided his shot wide of the net. Cavani then made a quick diagonal dart between Bellerin and Mustafi to chest down Di Maria’s chipped pass over the top, but he failed to make contact. Cavani broke past Koscielny twice in the final 20 minutes of the match, but the keeper was quick off his line to deny the PSG striker from point blank range. In truth, Cavani’s profligacy in the final third proved costly, and it’s difficult to determine the current issue with the striker. The best forwards in the world execute in 1v1 situations with the keeper, and though Cavani was once capable of doing so, his current issues in front of goal is plaguing PSG’s growth during this transitional period. Many strikers can learn from the movement that flustered the Arsenal back-line, but the finishing was surely forgettable. Wenger’s substitution was evidently a key facet, here, and it may have been inspired by Alexis creating Arsenal’s best chance – the Chilean dropped into a pocket of space in the left channel, but his reverse ball into Oxlade-Chamberlain resulted in a last-ditch Thiago Silva tackle. Wenger subsequently brought on Giroud for Oxlade-Chamberlain and than Granit Xhaka for Coquelin, meaning Alexis moved to the left. Xhaka’s physical stature and ball retention helped the Gunners sustain possession in PSG’s half, whereas Giroud presented a threat to the PSG centre-backs and kept them within the box when they retreated into their deeper second half base shape. More so, the minor alterations benefitted Alexis who freely occupied pockets of space on the left before charging forward to play reverse passes to advanced runners. Alexis’ movement into this zone, along with his ability to shrug off Krychowiak’s challenge was pivotal to his equalizer. The Chilean dispossessed Motta and ignited a break down the left shortly afterwards that should have won the match for the Gunners, but Iwobi was denied a historic match-winner. Aurier’s constant involvement during the first 70 minutes was superb, but as the match wore on, the right-back’s reluctance to track back into position also provided space for Alexis to exploit on the counter. With the Gunners pushing for a winner, Motta equally struggled to cope with their pressing, whereas Pastore’s introduction saw the Argentine create Cavani’s final chance that Ospina palmed away. Furthermore, Wenger’s changes shifted the balance of match in the second half and it was fitting that Ozil and Alexis were involved in the equalizer considering the initial set-up limited their influence. Alexis offered penetration and intelligent movement, which thus led to runners springing beyond the Chilean to provide service, whilst providing space to run at defenders from deep. Although this is the group-stage round, sometimes a bit of fortune is required to gain results in Europe. Arsenal were nowhere near the best in Paris, but they displayed the resilience and fight that’s consistently been missing within Wenger’s side. It must be said that Wenger’s decision to leave Xhaka and Giroud on the bench was odd, but he deserves credit for making the required changes to gain ascendancy. The defence still lacks familiarity, a Cazorla-Coquelin midfield is possibly to light to function as a midfield duo in Europe, whereas Giroud remains integral to Wenger’s setup. Still, this was Arsenal’s toughest match of the group and Wenger will take the point and aim to locate the correct balance throughout the XI. Emery must be wondering how his side didn’t record maximum points following their dominant display throughout the opening 70 minutes. Ultimately matches between the best sides are defined by small margins, as the combination of Ospina’s heroics and Cavani’s poor finishing provided Arsenal a lifeline to nick a point. It appears Emery will persist with the 4-3-3 that’s been successful in recent years, but with no top class replacement available, the PSG manager must get Cavani back to his ruthless best. Arsenal’s lack of personnel in defence may have been a concern prior to kickoff, but Arsene Wenger’s men were rarely tested for large portions of the first half. Without Laurent Koscielny, Gabriel, and Per Mertesacker, Arsenal were forced to field a partnership between new signing Rob Holding and Calum Chambers. This could explain why Wenger opted for a defensive-minded midfield pairing of Mohamed Elneny and Francis Coquelin to protect the make-shift back four, rather than handing Granit Xhaka his Gunners debut. The duo ensured Liverpool’s attacking trio and Georginio Wijnaldum were forced to receive passes in tight areas, which ultimately constrained the away side’s attack. In return, Arsenal’s buildup play suffered as they lacked the creativity and passing range from deep that they would receive had Xhaka or Santi Cazorla operated in that zone. Still, Liverpool’s sole attacking threat in the opening half stemmed through Sadio Mane’s pace in transition and capitalizing on poor Arsenal passes out the back, opposed to exploiting space between the lines. Klopp’s men were constantly harried in possession, meanwhile without the ball, they didn’t display the dynamic pressing they’ve become renowned for during the Liverpool manager’s reign. Therefore, Wenger’s men enjoyed the better spell of possession, despite experiencing a similar issue circulating the ball towards the attacking players. Apart from a brief spell where Theo Walcott exploited Liverpool’s main weakness – Alberto Moreno’s positional intelligence – Arsenal’s buildup play was equally subdued. Aaron Ramsey drifted into pockets of space to link play, but the hosts lacked Giroud’s presence upfront and genuine passers in midfield. Despite the sloppy play from both sides which should be expected in the opening weeks, the pattern of the match wasn’t surprising. 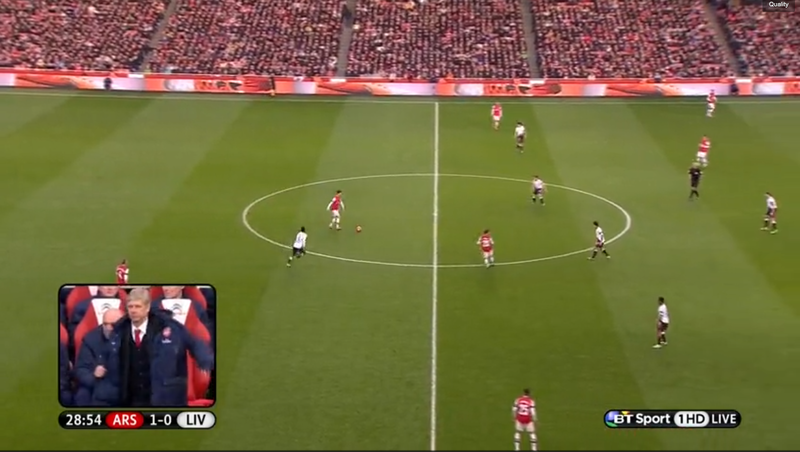 Ramsey was able to float into space as Liverpool didn’t field a natural holding midfielder, while the narrow positioning from Klopp’s attacking players was negated due to Wenger’s decision to deploy two destroyers ahead of his make-shift back four. Ultimately the defining feat of the match involved Philippe Coutinho – a popular Brazilian player that is highly rated based on the goals he scores rather than his overall performances. Here, however, Coutinho’s performance merited the plaudits he often receives, leaving Arsenal shell-shocked in the process. “It looked like after half an hour with 1-0 for Arsenal — it’s very warm and it’s the first game — that it’s not a Liverpool day. But then we strike back and that’s very, very important,” Klopp said. “It showed we can score goals. We can always score goals, and we can defend much better — that’s what we have to do. Coutinho’s downfall in around the final third is his inability to make the right decisions or complete incisive passes around the box, but his efficiency at the Emirates was fairly promising. The late first half stoppage time equalizer was a sensational free-kick that provided a lifeline for the Reds who failed to test Arsenal goalkeeper Petr Cech in the opening half. Arsenal’s energy levels declined significantly in the second half, which allowed Liverpool time to retain possession and constantly combine in the hosts’ half. First it was Coutinho’s no-look flick pass that enabled Wijnaldum to charge into half space to locate Lallana’s onrushing surge into the box to put Liverpool ahead. Minutes later, a lengthy Liverpool passing move saw Coutinho make a clever dart into the box to direct Nathaniel Clyne’s cross past Cech. The simplicity in Liverpool’s move was down to improved interchanging movement along with Arsenal failing to replicate the work-rate showcased in the first half to close down ball carriers. An exceptional individual goal from new signing Mane appeared to put the game out of reach, but Wenger’s substitutions nearly ignited a three-goal comeback. Alex Oxlade-Chamberlain provided improved dynamism and direct running, which equally resulted in an individual slalom similar to Mane’s that decreased Liverpool’s lead. Then, Cazorla replaced the injured Ramsey and delivered a pacy curling free-kick with 15 minutes remaining to identify an equalizer. Xhaka’s brief cameo displayed his passing range from deep, but Arsenal were still vulnerable in transition as they pushed men forward in search of a late goal. The worry for Klopp, however, was the near late collapse of a three-goal lead. You expect Liverpool’s pressing and energy levels to improve throughout the season, and though they finally exploited Arsenal’s unconvincing make-shift back four, Klopp’s men must sustain their defensive work-rate and mental discipline throughout 90 minutes. Even when Liverpool haven’t played well over the past few years, the Reds could still rely on a Coutinho wonder-goal. However, Liverpool’s win at the Emirates was the complete performance that saw the Brazilian score twice and create another. If Coutinho can consistently replicate performances of this nature on a weekly basis, it would not only merit his current status, but present Liverpool with a legitimate chance in challenging for a top-four spot this season. Arsenal supporters were sweating profusely with the Premier League season swiftly approaching, as Yaya Sanogo and Mathieu Flamini were the only players brought into the club on free transfers. In search of a trophy and a world-class player, Gunners supporters were forced to watch their league rivals bolster their squad, while they quickly refreshed their twitter page, with hopes of a transfer announcement on the official Arsenal feed. However, the boos that echoed throughout the Emirates Stadium following Arsenal’s opening day loss to Aston Villa last season were quickly forgotten. There’s a new vibe around the Emirates this time around, as they secured Champions League football for another season and ended their lengthy trophy drought by claiming the FA Cup in May. The animosity’s transitioned into glee, and the fact that Wenger completed four signings before August signals a change in direction. The swagger in his step along with the smile that warmed many hearts during his first decade in England has returned. The positivity floating around the Emirates derives from winning trophies, but now Arsenal faces another stern task. How will they build on last season’s success? It’s been awhile since the incessant banter surrounding a trophy drought, the urgency to acquire a world-class player, or the chances of remaining in the top four haven’t dominated Arsenal’s preseason discussion, which serves as a victory in itself. Arsenal has kept the core of their squad at the Emirates, and Wenger expertly utilized his time in Brazil to poach some of the World Cup’s key performers. David Ospina and Mathieu Debuchy are straight replacements for the departed Lukasz Fabianski and Bacary Sagna, Joel Campbell’s successful World Cup has rewarded him with a return to the Emirates — opposed to another loan move — while Callum Chambers is a versatile defender for the future. Wenger, however, won over the fans with the addition of another world-class signing in Alexis Sanchez. There was doubt surfacing around North London regarding Wenger’s ability to attract world-class talent, but following the signings of Ozil and Sanchez, the Frenchman has put those claims to rest. Equally, he’s learned from his mistake with Ozil’s transfer last year, and appears to have a concrete plan on how to utilize the vibrant Chilean attacker. Sanchez is an exceptional talent that has undergone several positional changes over recent years, and his versatility provides Wenger with variety in attack. Last season, Arsenal solely relied on Olivier Giroud, as Yaya Sanogo wasn’t — and still isn’t — ready to lead the line on a consistent basis, and Sanchez’s arrival provides Wenger with substantial flexibility upfront. Giroud lacks mobility and pace, but he prefers to play with his back to goal and link play with on rushing runners. Sanchez, on the other hand, offers a contrasting element of attack as he’s a diminutive pacy attacker that charges towards goal. The Chilean’s physique is misleading, though, as he’s capable of shrugging off defenders to link play and his admirable work-rate sees him successfully challenge and win aerial duels. The one odd feat about Sanchez is that he tends to miss the easy chances, but is capable of providing moments of sheer brilliance. Sanchez and Giroud would form the perfect strike partnership with their contrasting styles, but it’s likely that Giroud will start the season as the main striker, with Sanchez playing on the right until Theo Walcott returns from injury. Arsenal’s attack improves with the signing of Sanchez, but Aaron Ramsey’s fitness is also a key factor this season. Ramsey was indubitably the best midfielder in the country prior to his injury last winter, and his form towards the end of last season — that included a cracking volley against Norwich and the game-winning goal in the FA Cup final — has been carried into preseason. Although Arsenal’s preseason results varied — two one-goal defeats and a convincing win over Benfica — Ramsey offered the creativity, tackling and running that has seen him transition into an exceptional all-rounder. Wenger, however, must get the best out of Ramsey’s teammates, who have stagnated since their arrival at the club. Jack Wilshere has been considerably mediocre over the past few seasons, Santi Cazorla has failed to replicate his form from his first season at the Emirates, while Alex Oxlade-Chamberlain and Theo Walcott need to remain fit. This could explain the arrival of fitness expert Shad Forsythe, as Wenger hopes to decrease the injuries that occur throughout his squad, but the English trio must also incorporate a level of consistency to their game. Likewise, Ozil’s second season in England should see him reach the levels that many expected to see with runners in Sanchez, Walcott and Oxlade-Chamberlain available. The main concern, though, lies within their options at the defensive midfield position with Flamini and Mikel Arteta protecting the back-line. The former displayed his inability to provide adequate cover over the course of the season, while Arteta — who in fairness isn’t a natural holding midfielder — is exposed on a weekly basis on the counter-attack and against top-class play-makers. The defence is equally questionable as they capitulated in the second half of last season. Although there’s adequate cover in the fullback positions, Kieran Gibbs has yet to improve, while the verdict will be out on whether Debuchy can eclipse the quality that Sagna offered on both ends of the field. 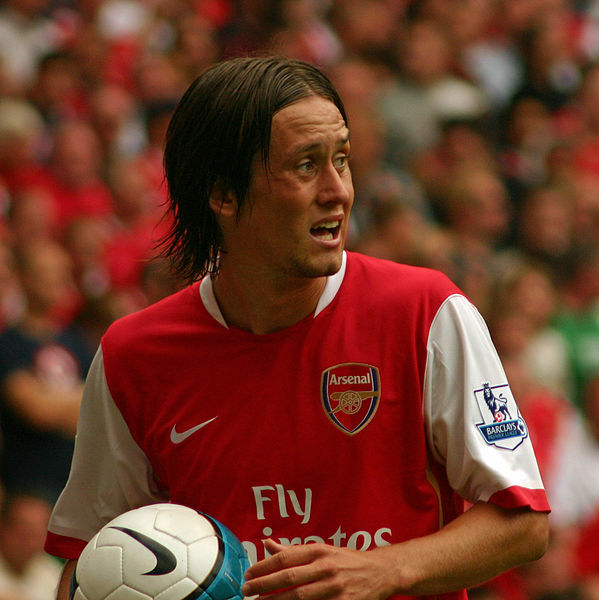 Similarly, Thomas Vermaelen’s move to Barcelona ensures that the arrival of an experienced centre-back is now a priority. Laurent Koscielny and Per Mertesacker formed one of the sturdiest centre-back partnerships last season, but it would be inane to solely rely on the duo and Chambers. Stylistically, Arsenal is likely to add a hint of directness with their possession-based system, despite their counter-attacking approach in preseason. Arsenal possess the quality to steamroll past inferior opposition in the Premier League, but their record away from home against the top-sides must improve. Away from the Emirates, Wenger’s side was battered against the teams that finished in the top five, along with falling short against Manchester United at Old Trafford. Of the teams that finished in the top-eight, Arsenal only enjoyed victories over Spurs, and Liverpool at the Emirates, which illustrates required improvement against the top-sides in the Premier League. Nevertheless, Arsenal is a better side this year, and while European supremacy is still beyond them, they’re inching closer towards legitimately challenging for the title. Domestic cup competitions appear to be the likely source of more silverware this season, but they possess a squad capable of pushing Chelsea and Manchester City to the finish line. More so, if Wenger intends on lifting his first Premier League title in over a decade, he will need improved performances throughout his squad and the arrival of a top-class defensive midfielder and centre-back. Arsenal is arguably two moves away from an unforgettable season, but even if they fail to bolster those areas, anything less than a third place finish should be classified as a disappointment. It’s time for the Gunners to push forward. Arsene Wenger’s decision to hand 21-year-old Yaya Sanogo a place in the starting lineup was the main talking point when the team-sheets came out. Prior to kick-off, Sanogo had only played 127 minutes for the Gunners, with this being his second start for the club. Wenger’s reluctance to sign a striker in January left many Arsenal fans frustrated, and with Olivier Giroud requiring rest, Sanogo was the best option available. The French striker led the line against Liverpool over the weekend, and played a key role in Alex Oxlade-Chamberlain’s opener when he wonderfully controlled Mesut Ozil’s cross, in which his blocked shot fell into the path of the Arsenal winger. Sanogo constantly made runs into the channels, while flustering Daniel Agger and Martin Skrtel with his physical presence and dynamism. Bayern Munich, however, is not Liverpool, they’re the best team in Europe and this presented a new challenge for the Arsenal striker. But Wenger’s inclusion of Sanogo was logical: here, he wanted to utilize his pace and great movement off the ball to attack the space behind Bayern Munich’s high-line. Santi Cazorla’s long ball over the top of the Bayern back-line signified the approach, as the Frenchman broke free, but the ball rolled out of play. Afterwards, his strength in the area led to a scramble, which resulted in Manuel Neuer making a wonderful save to keep the score levelled and prevent Sanogo from scoring his first-goal as a Gunner. Sanogo offers the mobility and pace that Giroud lacks, and with Bayern playing a high-line, and Theo Walcott unavailable, Giroud’s threat would be minimal. The 21-year-old displayed his work-rate in the first-half when he dropped deep to dispossess Javi Martinez, and then played a great ball into the right channel for Oxlade-Chamberlain, who nearly forced David Alaba into a horrendous error. Sanogo’s impact on the match decreased once Wojciech Szczesny was sent off, but Wenger’s decision to include the Frenchman in the starting XI was logical. The main talking point surrounding the first half was the controversy in the penalty box. Arsenal pressed and harried the European champions in the opening 15 minutes, and Wenger’s men created the better chances. The Gunners were rewarded for their positive start when Jerome Boateng made a clumsy tackle on Mesut Ozil, thus resulting in a penalty. Similar to his spot-kick against Marseille earlier this season, the German’s languid run-up led to Neuer comfortably batting away Ozil’s poor penalty. Subsequently, the momentum shifted and Bayern began to connect their passes and dictate the tempo of the match. Despite lacking penetration, and struggling to shift the Arsenal back-line out of position, Wenger’s men dropped deeper towards their box. It took a scintillating ball from Toni Kroos to Arjen Robben to carve open Arsenal’s defence, and it forced Szczesny to commit a reckless challenge on the Dutch winger. The Polish goalkeeper received a red card, which forced Lukasz Fabianski to enter the fray, while Santi Cazorla was sacrificed. Alaba stepped to the spot, but was forced to patiently wait for Arsenal to make their changes, and during that time he witnessed a wall of Gunners supporters heckle and jeer him. It took approximately two minutes for Fabianski to enter the goal, and Alaba’s mind was clustered. The Austrian left-back sent the Polish goalkeeper the wrong way, but his shot hit the post. Both sides received the opportunity to take the lead through well-deserved spot-kicks, but neither shooter coped with the pressure – however, Bayern’s man advantage gave Guardiola’s side the onus to push for an away goal. For all the depth Bayern Munich possesses throughout their squad, the one player that doesn’t receive the credit he deserves is Toni Kroos. Kroos has been the heartbeat of Bayern’s creative play, and the 24-year-old midfielder saved his best performances for the European stage. Last season at the Emirates, Kroos’ remarkable goal ignited a Bayern onslaught, but this time Szczesny saved his fantastic strike in the second minute. Yet, while Bayern struggled to cope with Arsenal’s energetic start, Kroos calmly settled Bayern into the match. He wandered around midfield looking for spaces to pick up the ball, and his precise passing helped his teammates come to grips with the frenetic pace. Kroos’ passing was magnificent, and his ability to retain possession was also pivotal towards Bayern’s dominance. The German dynamo was at his best in the second half as Bayern picked up their tempo. Phillip Lahm cleverly created an angle for Kroos to fire an unstoppable shot into the top corner, to secure an important away goal. The German was imperious in midfield and his long diagonal ball to Arjen Robben, followed by a well-weighed pass into Rafinha highlighted his creativity, but both wide players failed to provide an accurate final ball to increase Bayern’s lead. Kroos received an opportunity to kill the tie with seconds to spare, but his well-placed, low-driven shot ricocheted off the post. It’s been nearly two years since Kroos’ master-class against Madrid , and his long-term injury forced him to miss last year’s road to Wembley. The German, however, is eager to display to the world that he’s Bayern’s key man, and arguably the best no.10 in the world, by guiding the Bavarians to their second consecutive Champions League triumph. 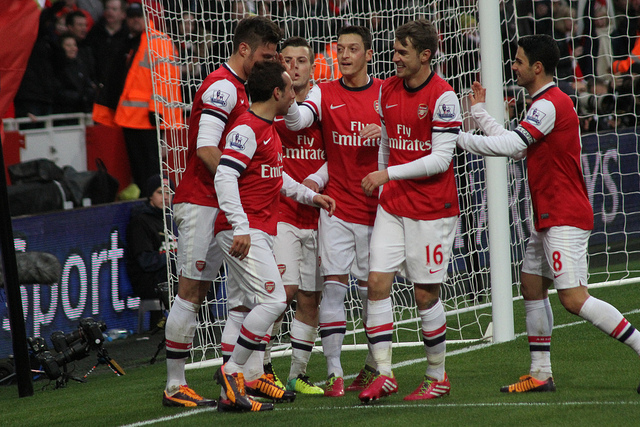 Arsenal advanced to the last eight of the FA Cup with a resilient victory against Liverpool at the Emirates. Arsene Wenger made several changes to the starting XI that drew Manchester United in midweek. Yaya Sanogo led the line with Alex Oxlade-Chamberlain and Lukas Podolski filling in alongside Mesut Ozil. Mathieu Flamini returned from suspension, Lukasz Fabianski started in goal, and Carl Jenkinson and Nacho Monreal started at full-back. Brendan Rodgers made two changes to his starting lineup, as Daniel Agger slotted into the back four, and Joe Allen joined Steven Gerrard, and Philippe Coutinho in midfield. Liverpool started the match well, but defensive lapses and woeful finishing saw them crash out of the FA Cup. Liverpool produced arguably the best 20-minute spell of football in Premier League history during their 5-1 victory over Arsenal at Anfield, and were looking to replicate that performance at the Emirates. Rodgers’ side have started matches well this season, scoring majority of their league goals in the first-half, and they will be disappointed that they weren’t two goals ahead within the opening five minutes. Daniel Sturridge was played in free – courtesy of a Gerrard through ball – against Fabianski, but the Polish goalkeeper saved his tame effort. Minutes later, Luis Suarez chipped a delicate ball over Arsenal’s back four towards Sturridge, and while the Liverpool striker rounded Fabianski, his shot hit the side-netting. Within the opening five minutes Sturridge was presented with two glorious opportunities to possibly replicate the result at Anfield. Apart from an ambitious shot from Suarez at the edge of the box, Liverpool failed to create legitimate goal-scoring opportunities for the remainder of the half. The first-half lacked the high-octane, free-flowing football that both sides are renowned for and that was down to their shape without the ball. Arsenal dropped into two banks of four without the ball and encouraged their wingers to press Liverpool’s fullbacks, while Mikel Arteta energetically closed down Philippe Coutinho – as the Brazilian struggled to cope with the physical battles in midfield. Sturridge had minimal impact on the match due to Laurent Koscielny’s proactive role, in which he didn’t allow the striker to turn with the ball. More so, it was peculiar to see Liverpool reluctant to play balls in behind the defence. Flamini offered grit in midfield, while Arsenal still lacked pace at the back. 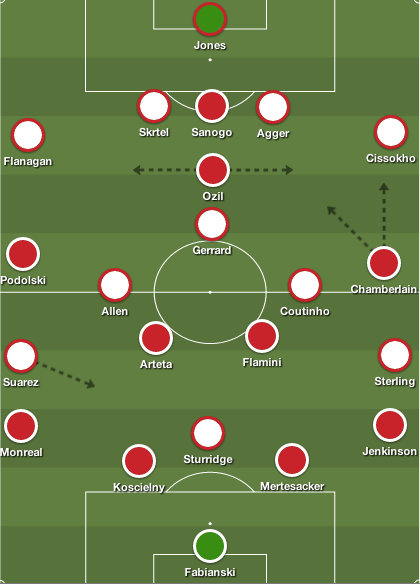 Liverpool, on the other hand, dropped into a 4-5-1 that at times looked like a 4-1-4-1. Rodgers also encouraged his side to close down Arsenal’s full-backs, while Coutinho and Joe Allen alternated when pressing Arteta. Some of Jordan Henderson’s best performances have come against Arsenal, and his dynamism was missed in midfield, as Arsenal exploited pockets of space in the first half. Liverpool’s key player in attack was Gerrard. With Lucas absent, the Liverpool captain remained at the base of the midfield, and constantly switched the Reds’ route of attack. Gerrard was the most proficient passer, completing 64 passes, and he created Liverpool’s best chances in the match. The key to Gerrard’s success, however, was the fact that no Arsenal player applied pressure on the Reds skipper. Mesut Ozil preferred – or was instructed by Wenger – to drop ahead of the midfield bank of four, opposed to limiting Gerrard’s influence on the match. In the opening minute his well-weighed through ball to Sturridge should’ve handed the Reds a lead. Subsequently, Gerrard’s second half cross-field diagonal ball towards Coutinho should’ve seen the Brazilian level the score, but he opted to play a tame cross into the box. Gerrard was also influential via set-pieces, as his cool penalty narrowed the lead to a goal, and his free-kick delivery to Martin Skrtel was an additional goal-scoring opportunity. Gerrard provided a positive impact towards Liverpool’s attack due to Arsenal’s naivety without the ball, but poor finishing and decision-making aided Wenger’s side. Ozil’s performance at Anfield was maligned by the media, as the German looked disinterested; he casually drifted through the match, and was constantly bullied off the ball by Henderson and Gerrard. The German’s looked knackered as of late, which could be down to Wenger mismanaging his minutes, but here the 25-year-old midfielder quietly sparked Arsenal’s attack. Specifically in the first half, when Arsenal pushed forward, the Gunners located pockets of space throughout the midfield and Ozil was often the lynchpin behind their attacks. Ozil was the link in attack; whether it was his delicate chip to play in Sanogo, his cross that led to Chamberlain’s goal, or his ability to evade a challenge before driving to the box to have his shot blocked, the German dictated Arsenal’s activity in the final third. Ozil’s inch-perfect pass to Chamberlain in the second half, allowed the Arsenal winger to cut back the ball to Podolski for Arsenal’s second goal. Ozil’s contribution in both goals signified his importance to Arsenal’s attack, as the German was heavily involved in majority of the Gunners’ offensive moves. With Theo Walcott out for the remainder of the season, the talks as to who will play in wide areas in Brazil has been heavily debated. 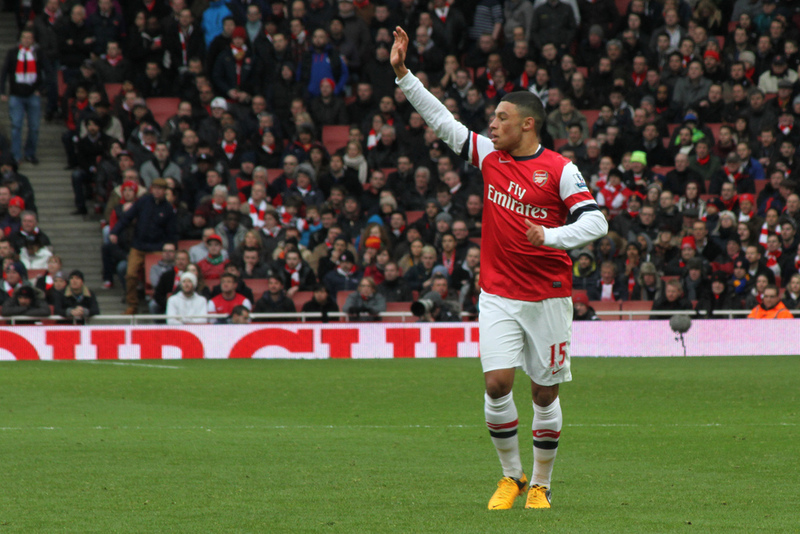 At the Emirates, two ideal candidates in Oxlade-Chamberlain and Sterling were eager to impress. Oxlade-Chamberlain was terrific on the night – he constantly tracked back to protect Jenkinson, thus keeping Aly Cissokho quiet throughout the match. He scored and assisted a great goal, and his pace continuously tormented the Liverpool back-line. Oxlade-Chamberlain’s pace also exposed Gerrard’s vulnerability at the base of Liverpool’s midfield. The Arsenal attacker generally picked up the ball from his own half and quickly transitioned into attack, thus resulting in Gerrard and Coutinho making poor challenges and earning yellow cards – Gerrard was fortunate not to see red as he committed a clumsy second-half tackle, which merited a booking. Likewise, Sterling, who’s been in great form over the past few weeks, was dangerous in the second half. With Liverpool forced to attack, the English winger constantly received long diagonal balls from Gerrard and attacked Monreal. Sterling was successful beating defenders and stretching the play towards the byline, but his final ball was often poor. Yet, towards the latter stages of the match, when Rodgers fielded him as an attacking right-back, Sterling showcased his defensive attributes and impressive work-rate, by constantly getting back into position and making timely tackles. Although Sterling didn’t replicate the impact he posed in the league encounter at Anfield, he, as did Oxlade-Chamberlain, displayed that they could fill the role that Roy Hodgson demands in wide areas. With limited options on the bench, Rodgers introduced Henderson for the ineffective Cissokho, as Liverpool became a 4-2-3-1. Jon Flanagan moved to the left and Sterling became a right full-back. 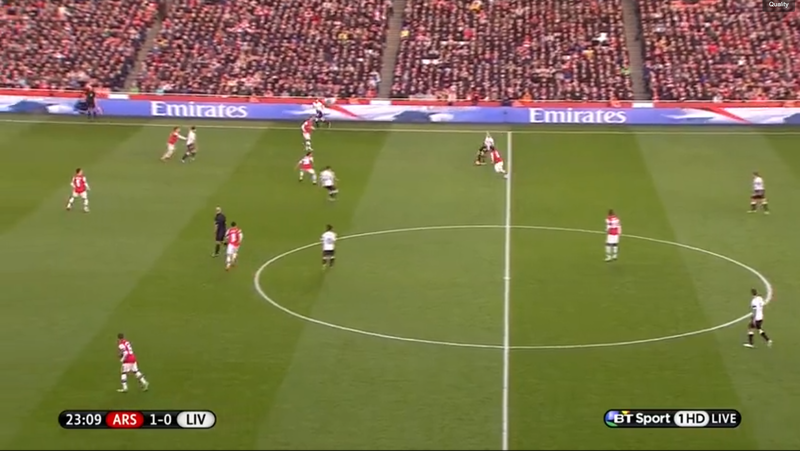 Suarez drifted centrally, allowing Sterling to peg Arsenal back and attack the space behind Podolski. Henderson occasionally pushed forward, but he often sat deep with Gerrard, which allowed Coutinho more space in midfield. As Arsenal dropped deeper towards their box, Liverpool, and in particular Gerrard received more space to switch balls from flank-to-flank. Liverpool’s best chance came when Coutinho drifted into space and played in Sturridge, but as he tried to round Fabianski, the Polish keeper pushed the ball away. Apart from the aforementioned Gerrard ball to Coutinho, Liverpool’s other opportunities were snap-shots from Suarez and Sturridge from distance. Wenger’s reluctance on removing Ozil was peculiar, considering his limited influence in the second half, lack of defensive work, and the fact that they host Bayern Munich in midweek. However, Cazorla replaced Podolski at first, which was also odd based on his limited defensive work – and Sterling still posed a threat down the right. Minutes later, Kieran Gibbs replaced the leggy Oxlade-Chamberlain, and swapped flanks with Cazorla. Now, Gibbs nullified Sterling’s threat in attack, and his energy pegged Sterling deeper into his half, forcing him to defend. Giroud replaced Sanogo to wind down the clock, as Arsenal survived Liverpool’s second half resurgence. Despite an early scare, Arsenal was clinical in front of goal, and escaped the Emirates with an important victory. Rodgers was upset with the result, and poor officiating, but he highlighted that clinical finishing was the difference. “We could very easily have had another five or six goals today, but we weren’t as clinical,” Rodgers said. Howard Webb’s poor officiating will dominate headlines, but besides a few defensive issues, Wenger’s weakened side showcased resilience at the back – including Fabianski’s key saves – as they gained revenge for their drubbing at Anfield. Nevertheless, the games key players could all play a key role in England’s World Cup quest. Oxlade-Chamberlain’s pace, defensive work, and quality in the final third snuck Arsenal past the Reds, but Gerrard’s passing could’ve equally tilted the tie if his teammates converted their chances.